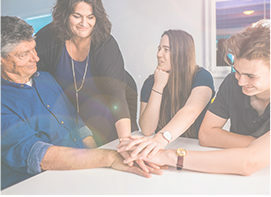 Expressing sympathy for a loved one via an In Memory to GCF is a very thoughtful way of remembering someone whilst at the same time assisting GCF to continue to make a positive difference to GI cancer outcomes in New Zealand. You can now set up your own ‘In Memory’ tribute page and email out to friends and family asking for donations in lieu of flowers. Please note the person you are remembering and your own details to ensure a receipt can be issued. In Memoriam donations can be acknowledged to the bereaved family by instructing us to do so via email or letter. 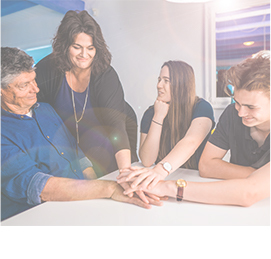 Leaving a gift in your Will helps us build a fund to support gastro-intestinal cancer research, helping save lives and improve quality of life. Help us Kick Cancer in the Guts, keeping families together! Gifting through your Will to a charity is one of the significant forms of ensuring not-for profit organisations like GCF can achieve their aims. For many people this is the only way that they can contribute to organisations that may have helped them or someone close to them. It is the future generations that can benefit from those that have gone before them. Specific Bequests – such as land, jewellery, shares. General Bequests – these are sums of money or a percentage of your estate. Residual Bequests – the balance of your estate after the specific and general bequests and any funeral or administrative costs have been deducted. 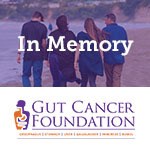 Gifts to GCF can be specified to be used for general activities including education and awareness or specifically for GI cancer research to help change the outcomes for GI cancer. If you do not have a Will or wish to make a new Will, GCF is registered with www.perpetualgiving.co.nz. A Will costs only $100 through this site and choosing our charity or other worthy causes is part of the online Will process. Making a Will has never been so easy and is an important document for anyone with any assets. Support towards GCF must be recorded by your solicitor. It does not require you to write a new Will if you already have one but simply requires you to make an amendment (codicil) to include GCF. Please contact our Executive Officer, Ruth Davy at rdavy@gutcancer.org.nz or on 0800 112 775 if you have any questions. All gifts received by GCF are treated in confidence but we welcome the opportunity to thank you during your lifetime. If you are in agreement, on completion of your Will, we would welcome you contacting GCF to let us know your intentions.